A couple of years back I was introduced to HoMedics who sell a range of personal health and wellness products. HoMedics are popular for their range of home massage products and have been a leading innovator in massage technology. Their wellness range includes humidifiers, sleep aids, fitness monitors etc. I have used their Shiatsu cushion and it has served me well. So, my impression of the brand has been positive. A few months back I had the opportunity to trial the Shiatsu Max 2.0 Back and Shoulder Massager with Heat. And I readily took up the chance. I have always suffered from neck and back problems (it runs in the family) and use different kinds of massagers. I have hand-held massagers, a mini travel one (which my aunt got from the USA) and the Homedics Shiatsu cushion. The Shiatsu Max 2.0 felt like the perfect progression in the line of massagers I have. It promised to deliver a more intense massage experience for the back and it certainly did. The ShiatsuMAX 2.0 is designed to easily target aches and pains, using a simple remote control and up to 14 massage programs. You can personalise your massage at home by choosing from a variety of techniques like signature Shiatsu, Rolling massage, Spot Shiatsu and Vibration massage. The ShiatsuMAX is very easy to operate - the simple remote control provided is to be used to customise your massage. In total 14 different massage programs with variable intensity - Shiatsu, Rolling and Spot massage for back and Vibration massage for upper legs and thighs - can be achieved. There is a demo button on the remote which will take you through all the different features so you know what to expect from each massage. Shiatsu : a deep, kneading massage which uses circular motions and is perfect for relaxation and loosening of tight muscles. Rolling : this one runs up and down the length of your back and is an excellent way to stretch and soften the muscles. A third, additional option is the Vibration feature which on activation provides a relaxing treatment to the upper legs/thighs. You can use this in conjunction with either of the two modes listed above. There is a soothing heat function as well (an extra and optional feature) that can be used to intensify the massage. You simply need to press the heat button and it will impart an increasing warmth. Both myself and Mr.H have been using the massager and have been loving it. I love the soothing relaxation the ShiatsuMAX offers. The heat feature has been perfect for the cold days. Even a 15 minute session with ShiatsuMAX ensures that tired and aching muscles are cared for and feel relaxed. Mr.H doesn't have any back or shoulder problems but he likes the Rolling massage for the stretching effect it offers. We both agree that the build quality is excellent and the ability to adjust the position of the rotating massage mechanism (height and/or width) using the Spot Shiatsu controls is wonderful. It lends itself to a certain degree of personalisation. Another feature that I liked was the rotating massage mechanism which gives a very good lumbar massage. Performance wise the ShiatsuMAX scores full marks. Moving on to its appearance. The ShiatsuMAX has a soothing grey colour scheme and can blend into any décor - you could use it in your living room or in your home office or conservatory and it will complement any space with ease. The headrest and seat are adjustable which means everyone gets a comfortable massage. A washable back cover is provided for easy maintenance. You simply remove the back cover and pop it in the washing machine at 40 deg C. The rest of the massage chair can be cleaned with a warm, damp cloth. Overall, we have been mighty impressed with the ShiatsuMAX. For the couple of months that we have had it for, it has been put to a lot of use. A very useful thing to have at home if you suffer from back or shoulder aches and pains. Thank you Homedics for the chance to try this wonderful massage chair. 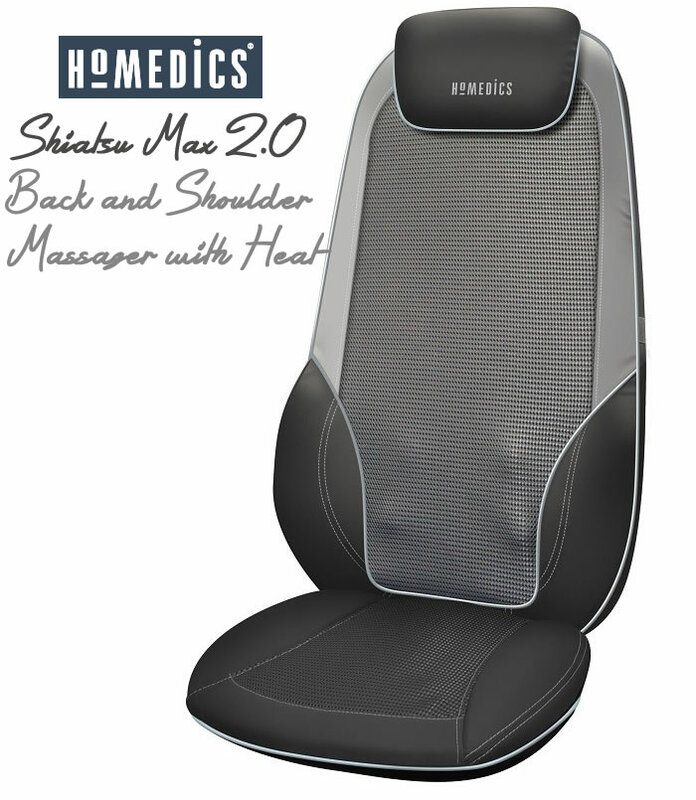 The ShiatsuMAX 2.0 has a RRP of £299.00 but at the time of publishing this post is on offer for £149.99 on the Homedics website. A very good deal, so grab it while it lasts.